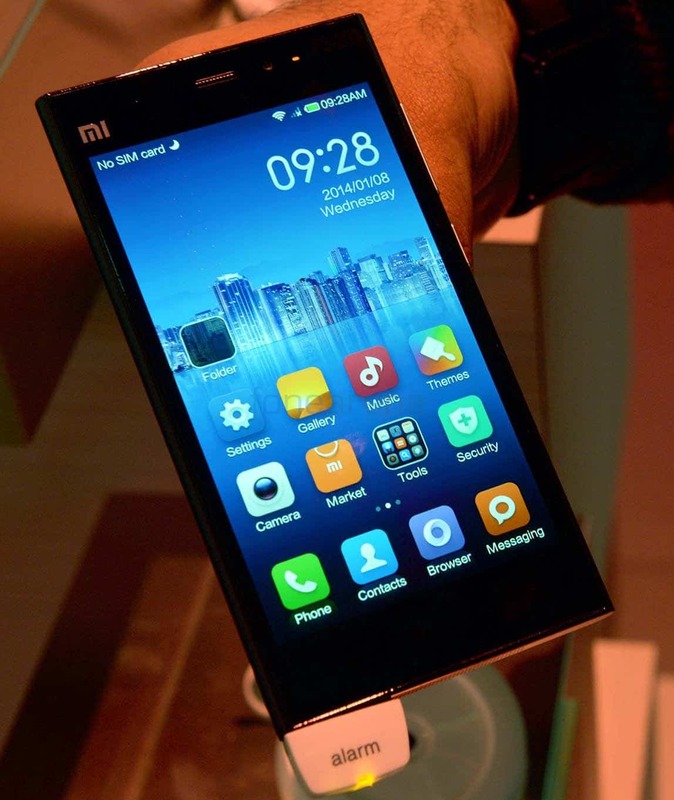 Xiaomi Mi3: Can it rock the smartphone market in India? After a lot of suspense and wait, Xiaomi finally unveiled their first phone in India, and they also made some good arrangements for publicizing it by launching a contest for people where they asked people to guess the first phone they are going to launch in India. 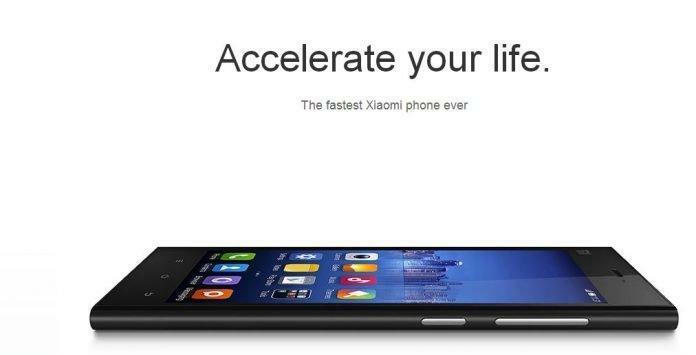 Finally, they launched Mi3, one of their best selling handsets which was launched in September, last year. They are now into the smartphone market in India and may be this thing has already turned out to be a headache for other smartphone companies in the nation like Micromax, Karbonn, Xolo and of course, Samsung because Samsung has a pretty good hold in the smartphone market in India and now, there is some chance of losing some of their shares. After all, Xiaomi is offering so many things in Mi3 like Qualcomm Snapdragon 800 processor coupled with 2GB RAM, a 1080p full HD display and a 13 MP snapper for all the photography needs, which you will probably find in a 20K priced smartphone, at a jaw dropping price of just 14999 INR. But here comes the question, ‘Will it be able to make a strong impact?’ or just gonna blow away after a short while. Let’s take a sneak peak into it to find out what’s inside the phone. Here are all the features you need to know about. 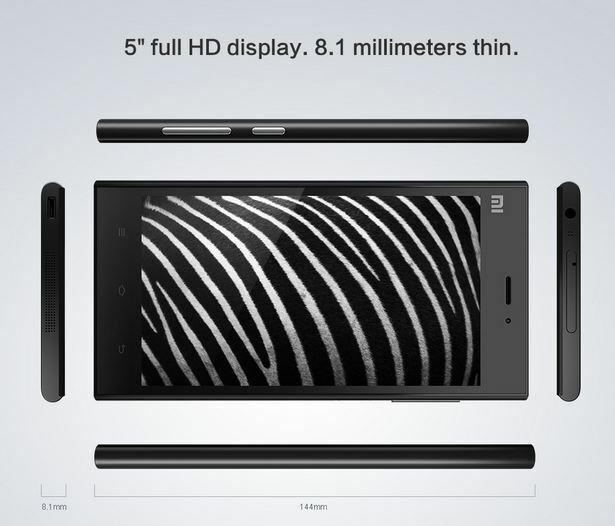 Keeping a track of the phablet trend, Xiaomi Mi3 has a 5 inch full HD display having a resolution of 1920×1080 and also a very good pixel density of 441ppi. According to the company, Mi3’s backlit display is fused directly to the touch screen which will provide greta visula experience to the users and there;s more- it can be used even when your hands are wet or you are wearing gloves. The phone is very sleek at just 8.1 mm and the frame is built of magnesium alloy, coated with 3 layers of graphite. 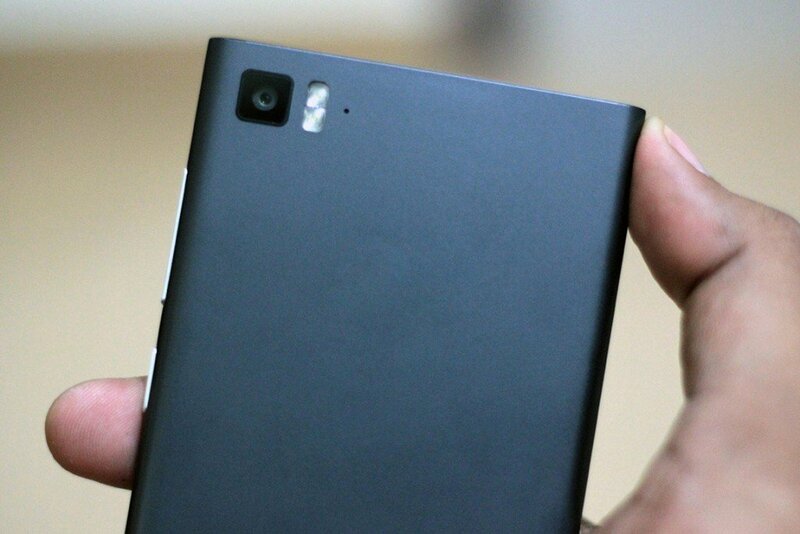 It measures 144 x 73.6 x 8.1 mm, and weighs just 145 grams. The phone comes in 7 different colors along with a waterproof cover. Overall, the phone looks great with awesome design and features. Mi3 runs on MIUI, which is a highly customized version of Android modded with their UI, called as MIUI and Mi3 comes with MIUI 5, which makes it a hell lot easier to customize everything. You can almost change every single thing, in case of visual looks, from boot animations to home-screen, which makes it very good for those people who want their phone to look unique and different from all other Android phone. MIUI is based on the latest Android 4.4 Kitkat and also has a good number of preinstalled apps, apart from downloadable apps from Google Play. Mi3 comes with Qualcomm Snapdragonn 800 with four Krait 400 CPUs. The processor is clocked at 2.3GHz and also has an Adreno 330 GPUfor gaming. It includes 2GB of RAM, which is enough for handling multitasking and switching between apps very easy and lag free. 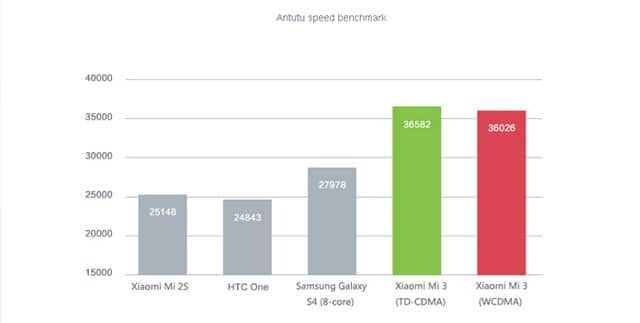 According to Xiaomi, some benchmarks indicate that the Mi 3 is faster than a couple of smartphones from big brands like the Samsung Galaxy S4 and HTC One. Mi3 comes with 16 GB of inbuilt storage. Although, it has 16GB and 64GB storage options, it launched only the 16GB version in India. There is no option for expanding storage due to the absence of a microSD slot. But, don’t worry. 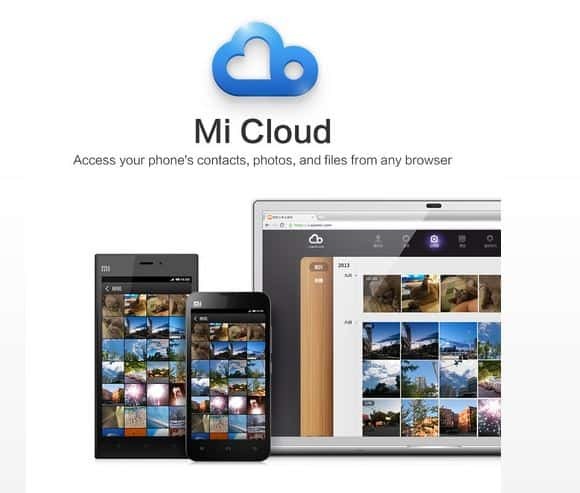 You can store your valuable pictures, videos and other contents in MIUI Cloud. In case of camera also, Mi3 does not disappoint us at all. It comes with a 13 MP snapper along with a 2MP front camera for selfies and video calling. And it has some other standard camera features like dual LED flash, f/2.2 aperture and 28mm wide angle lens, and the best thing, both the cameras support 1080p recording. In case of sensors, they are quite as usual. Mi3 has got a gyroscope, accelerometer, barometer, proximity, ambient light sensors and also a barometer. In case of connectivity also, there are no extra options available. Mi3 has NFC and GPS with Assisted GPS and GLONASS. It has the latest Bluetooth 4.0 and Bluetooth with Human Interfaces Device (HID) profile. And yes, it has got Wi-Fi also, like any other smartphones and supports Wi-Fi Direct. The phone comes with a highly powerful 3050 mAh Lithium-ion battery which promises 25 hours of talktime and a very good 21 hours of internet usage time on 3G. 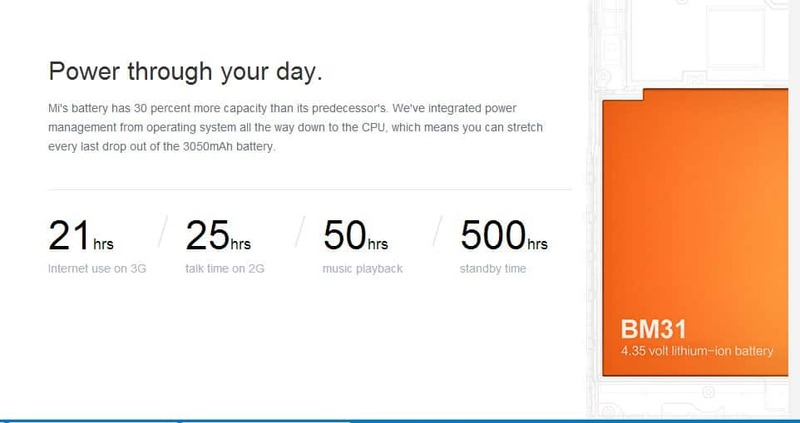 The phone also promises 50 hours of music playback and 500 hours of standby time. The company claims that they have got into deeper in case of power management and have optimized everything, from the CPU to the OS and they claim it to be one of the best power management capable phone. Xiaomi Mi3 is available at a jaw dropping price and it has proven itself to be one oft the toughest competitor of Nexus 5, which cost around 27K. In a small package, it comes with a lot of features and we don’t see any eligible competitors in the mid range smartphone category, not even under 20K. Xiaomi Mi3 comes at just 15K, amd I think it’s the best value for money in this price segment. But, till now I have experienced a lot while I talked to many people about this phone. Most people were amazed when I told them the specifications and features of the phone, but then when they asked which phone it was and I said the name, their reactions were quite shocking, like they have seen a ghost and immediately decided not to buy it just because it was a Chinese smartphone, that’s the only thing that may create some disturbance in their attempt to acquire a good amount of share in the Indian smartphone market. But, whatever may people say, I’m planning to buy this one, just need to wait a little more. What do you think about it? Let us know in the comments section below.